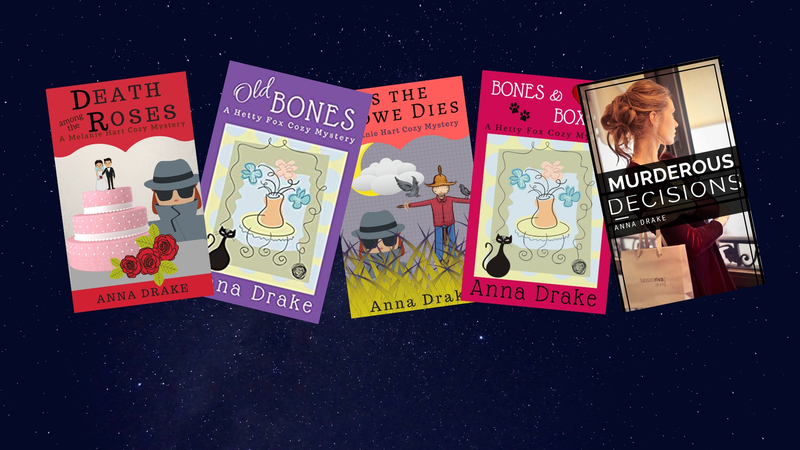 With one cozy mystery series underway, I’ve decided to launch a second series. While the first series focuses on two young women just starting out in life, this one features a weathered and wizened sleuth. Hetty Fox has a nose for scoping out trouble. But first she needs to resolve the problem in her own house. I pulled more yarn from my skein of wool and kept on knitting. I didn’t believe in ghosts. I harrumphed. Visits from dead sweethearts didn’t happen. This thing wasn’t real. Yet an exact image of Andrew Peters hovered in my living room. Dark hair, dark eyes, dark shirt. He looked entirely the same as he had in his youth, while I would turn sixty-five next month — and looked every minute of it. “You’re still beautiful to me,” he said. I paused to count my stitches. How dreadful of me to pull up an image from my youth and put such flattering words in its mouth. Was I really that desperate? Outside the winter wind whipped around the corners of the house. I pulled free more yarn and shook my head. Obviously, I needed to get back out into the world. I’d spent too much time locked up alone in this house. But there had been all the unpacking to finish. Plus, my cat had been terribly upset by the move. He had only recently settled back to his normal self. The ghost moved closer to me. My fingers faltered. My breath caught in my throat. “I am not your imagination,” he said. But my gaze flitted back to the creature. His image pulled at my heart. I’d loved him completely in my youth. But shortly before high school graduation, he’d died in a deadly car crash. Now, he hovered before me in my living room. I glanced down at Alfred. The cat looked up at me and blinked. He yawned. He stretched. He turned onto his side. I found his calm behavior comforting. If this ghost were real, Alfred would be hissing and bounding about the room. “Hetty?” a woman’s voice asked. She and I had met in the mystery section of the library a couple of weeks ago. We’d learned we were both widows who loved mystery books and had formed an instant bond. “I’m a little stressed at the moment,” my new friend said. I listened to the wind roar outside. It was a bitterly cold night. Then, I glanced back at the thing hovering in the center of my living room, its feet not quite touching the floor. In short order, I was out on the sidewalk, my coat collar gripped tightly about my neck. Both Rose’s house and mine sat atop a steep cliff in a small town located near the middle of Illinois. The dwellings came with a stunning view of the Illinois River and the houses beyond its rushing waters. As for the town, Hendricksville didn’t have much to offer. A big box store and two nursing homes were its main attractions. Even its trees were old. But at least they were tall, and graceful. and provided welcome shade in summer. But at night, when lights from the windows in the houses below twinkled in the clear air, I found the house a charming place to live. If it weren’t for this wrinkle with the ghost, I could be quite happy here. I gave myself a mental shake and scurried on, covering the short distance between Rose’s house and mine in record time. When I reached her porch, Rose threw back the door before I’d even knocked..
She took my coat, hat, and scarf. “Tea?” she asked. “Yes, that would be lovely.” I stamped my feet to warm them up. The room I stood in fit the town. Antiques were the norm here, and Rose’s house fulfilled that pattern. A pine hutch displayed old china. A braided rug lent warmth to the wide-board floor. Her cat laid stretched out in front of the heating vent. It lifted its head briefly to view my entry, then returned to its winter’s nap. I smiled, he certainly had his priorities straight. “The name doesn’t sound familiar,” I said, nodding my thanks for the mug of steaming tea she slid before me. We’d tossed on coats, and a short time later Rose pulled her little Honda from the garage and pointed its nose south. At Wilmot Street she turned right and proceeded straight for another two blocks. She slowed at the beginning of the next block and eased the car to the curb before a two-story house. “This is it?” I asked, eyeing the dwelling. Not a light shone from any of its windows. “Yes.” Rose switched off the engine. We stepped out of the car and took off down the sidewalk. The strong wind hurried us along. Rose fished a key from her coat pocket. I could tell from the deep lines on her face that she was worried. I crossed my fingers behind my back and prayed we weren’t walking into a disaster. At the door, my friend knocked three times without raising anyone. She glanced at me for a quick second before inserting the key. Then, she swung the door open. Backlit by the street light, I saw a long narrow hallway stretch out toward the back of the home. To its right, a stairway rose to the upper floor. I felt along the wall and found a light switch. I flipped it on. An overhead light bathed the hall in a brilliant glare. Everything looked normal. Pictures hung on the walls. A small table in the far corner boasted a lamp and a small piece of decorative china. Nothing had been disturbed. Nothing was broken. I crossed the hall to a set of French doors and entered the living room. Again I turned on lights. In the distance, the furnace rumbled. The scent of vanilla from a bowl of potpourri caught my nose. I checked the rest of the room for signs of trouble but found none. After I’d satisfied myself with the living room, I entered the dining room. Again, all things seemed to be in their correct places. I was just about to step into the kitchen, when something to my left attracted my attention. It was almost hidden by the dining room table. I bent over to get a better look. And when I realized what the object was, I instantly bounded up and screamed.